College is expensive and it’s getting more expensive every year. Over the past five years, according to the College Board, in-state tuition and fees at Oregon’s public universities has increased 30 percent, while private institutions have seen a 19 percent increase. Over the same period, average student debt in the U.S. has increased 31 percent to more than $27,000. The rapidly rising cost of higher education has left even the smartest researchers and the wonkiest of wonks wondering what’s happening and where’s all that money going. 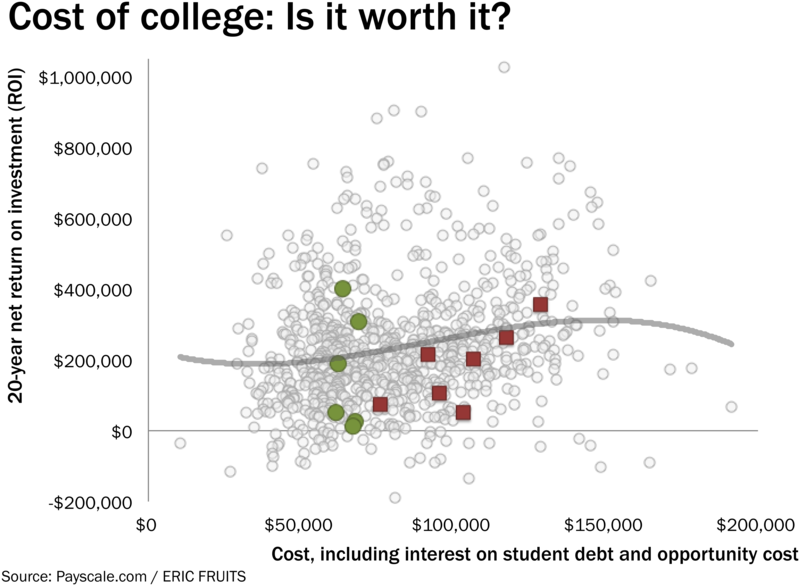 More and more, prospective students—and their families—are asking: Is college worth the cost? Over the past few years, the salary comparison website Payscale.com has collected salary data from its users and ranked U.S. colleges and universities based on which schools deliver the best bang for the buck, measured by Payscale’s calculation of the net return on investment (ROI). They measure ROI as the difference between a typical graduate’s earnings over 20 years and subtract out the cost of attending the school. The data are far from perfect, but there are enough data points to make some broad generalizations. The figure above turns Payscale’s rankings into a scatterplot. The green dots represent in-state tuition and fees for Oregon public universities, excluding Portland State University. The red squares represent Oregon’s private colleges and universities. There is a negative relationship between an institution’s costs and the return on investment: Bigger bucks yield a smaller bang. For example, on one extreme, University of Virginia cost about $26,000 for in-state tuition and fees and its 20 year ROI is 17.6 percent. At the other end, a student at Ringling College of Art and Design is expected to shell out almost $165,000 to end up with lower earnings than someone who did not go to college. The dots are all over the place. In other words, although there is a downward trend, in fact, there really is not much of a relationship between a school’s cost and its graduates’ earnings. This is highlighted by two Georgia schools that cost about $40,000 to graduate. On one end, Georgia Tech grads get a 17.1 percent return on their investment, while Savannah State University grads have a negative return on their investment. Oregon’s public universities have roughly the same cost to graduate, but have a wide range of returns on investment. While Payscale accounts for the variation in the time it takes a student to complete a degree across institutions, it misses some key costs of higher education. For example, the typical student graduates with about $27,000 of debt. Interest payments on this debt reduce take-home pay and reduce the return on investment for higher education. More importantly, Payscale misses the fact that, in most cases, full-time students give up full-time employment. In addition to spending money on tuition and fees, student are giving up money from four or more years of employment. The figure above adds some very back-of-the-envelope estimates to account for interest payments on student debt and the opportunity cost giving up employment while in school. It assumes the average amount of debt and that a student would give up full time work at the federal minimum wage. Yes, I know that’s not very realistic, but it’s pretty conservative and you’ll get the idea. 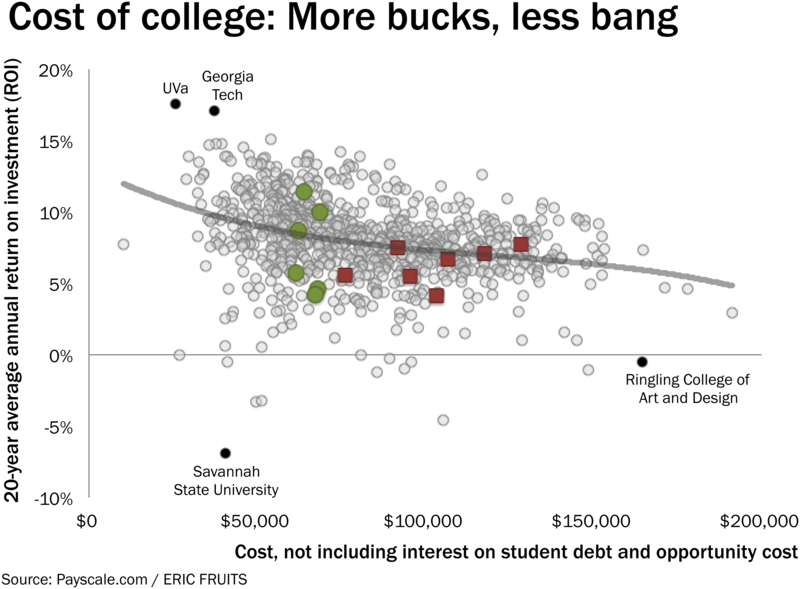 As with the ROI scatterplot, the dots are all over the place. In fact, there is hardly any relationship between the opportunity cost of higher education and future earnings. What is most striking, however, is how small the net benefits are—even for students paying in-state tuition. Students at Southern Oregon University and Western Oregon University just about break even on their college educations. If it took them a little longer than average to graduate, or if they incurred a bit more student debt, these students would have been better off skipping college altogether. Keep in mind that the data presented here looks only at the “average” student. The benefits and costs of education are unique to every individual. Having the right test scores, choosing the right major, and having a supportive network of family and peers can make huge differences in the payoff to higher education. Nevertheless, a look at previous Payscale studies shows that over the past few years, the return on investment in higher education is declining. Students seem to be paying more, but getting less. Research suggest new administrative positions—particularly in student services—have driven a 28 percent growth in the higher-ed work force from 2000 to 2012. At the same time, universities have shifted to a growing army of part-time instructors and full time faculty salaries have barely kept pace with inflation. The result is a set of institutions that have shifted their focus away from research, education, and training and more toward providing social services to employees and students. Unfortunately, I don’t see this trend ending soon. It will take a major student debt crisis for policy makers and educational institutions to refocus their direction away from growing the university bureaucracy and back to providing an education that is valuable to students and employers.